Three Bridges Cricket Club have signed a new overseas player from South Africa. Left handed opening bowler Andrew Smith arrived in England yesterday (Thursday) in time for the club’s opening game of the season on Sunday, April 26 when they travel to Dartford in the National Knock-Out Cup. They then face Burgess Hill at home in their first Sussex League Division 2 game on May 2. 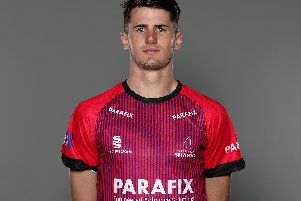 Measuring 6ft 4in tall Smith wants to get into the professional ranks and is aiming to get his new side back into the Sussex Premier League in their first season since being relegated. Smith revealed: “My uncle found the contact at Three Bridges through work and from there everything basically fell into place. “I got contacted by the club sent all my information through and then got offered a contract. “I would love to go all the way with cricket. Smith will be staying in Crawley with members of his family.